You enter the Villa through enormous wooden doors which bring you straight into the huge entrance foyer with a winding staircase in front of you and an incredible chandelier hanging from above. This house is filled with interesting pieces which have been lovingly sourced by the owner. The entrance foyer has an old grandfather clock, a stylish chaise longue and some large Chinese vases. A door leads into the main kitchen and dining area. There is also a back kitchen which is home to most of the appliances including the washing machine, tumble dryer and American style full fridge freezer. A walk-in pantry is ideal for storing your dry goods. The main kitchen is bright and spacious and has a big island unit. The range adds a homely effect and there is also an electric oven for those who may prefer. The dining area has a large table which can sit up to 8 people but additional chairs could be added for larger groups. There is a display cabinet full of interesting crockery and pieces which you are welcome to use during your stay. A set of double doors leads from the dining area outside and there is another door leading from the kitchen. There is a patio area with furniture to enjoy your tranquil setting. The main sitting room is through the door to the right of the main entrance foyer. It is a large comfortable and cosy room with a very large wall mounted TV offering satellite channels, three couches and a coffee table. A guest toilet is through a door from the sitting room. Wifi is available throughout the house. The drawing room is also in this area. This is a lovely room to relax and spend time together. There is a welcoming open fire and it would be the ideal grown ups room to have a drink and catch up on old times. To get to the bedrooms you go up the winding carpeted staircase to the landing area. Five of the bedrooms are on this floor. There are two double bedrooms with ensuites (one with shower and one with a free standing bath). Of the three remaining bedrooms, two have double beds and one has two double beds in it. They all have access to the enormous main bathroom on this floor with a double size bath and a separate shower. The master bedroom is located on the top floor and takes up the entire floor! There is a huge dressing area along with two seating areas. It has a king size bed, a TV and the biggest wardrobe! Doors lead out onto a private terrace. This room has a large ensuite with shower. 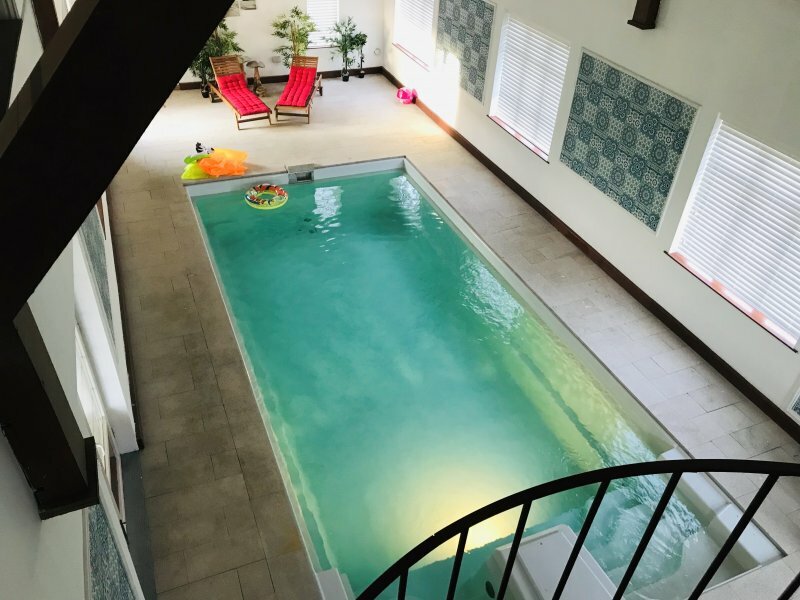 Downstairs, the door that leads to the sitting and drawing rooms, also continues through to the door into the bar and the swimming pool (this can be locked for safety). There is an outdoor terrace leading from the bar- ideal for BBQ! A wrought iron winding staircase brings you down to the pool area. It is a 20 meter long pool ideal for swimming laps for just for playing in. This is a large and luxurious but very welcoming Villa where you will feel at home from the moment you arrive. Prices include all utilities, wifi and housekeeping every 3 days.